Hair Salon Bournemouth – 10% off Bookings In January!!! Give your hair the treatment it deserves with Level Hair Salon Bournemouth. Located in two locations, one salon in Bournemouth and the other in Christchurch, Level is offering 10% off bookings this January! The offer is exclusively for Level clubcard holders and is valid in January only! To have access to this offer and many other similar fantastic offers at the luxury hair salon Bournemouth, please continue reading. Hair Salon Bournemouth – Fantastic Offers with the Level Clubcard! Level clubcards cost £35 and entitles you to receive a 20% discount on all services at Level Hair Salons. To make sure you don’t miss out on the great offers at Level, please click here and fill out the form. 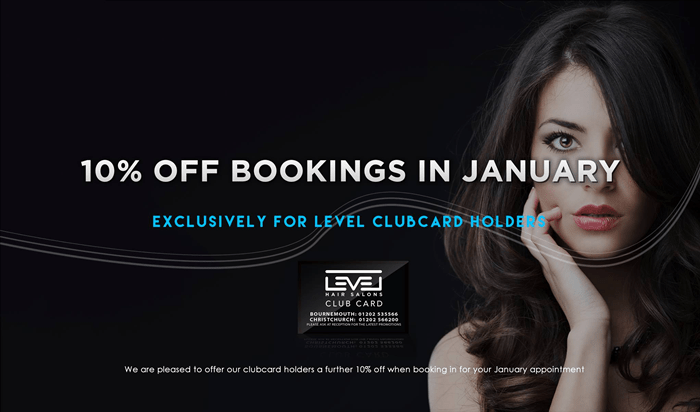 As a holder of the Level Clubcard, you can access discounts to many of the services that Level Hair Salon Bournemouth and Christchurch have to offer. Level offer great hair products that will accommodate all customer hair types. We can repair damaged hair, tame curly hair and even get you prepared for the summer with our hot holiday hair tips. To learn more about the amazing hair services we offer at level, please click here. To find out more how you can get yourself the best hair and beauty treatment offers including the January 10% discount booking and many more, please get in contact with Level Hair Salon Bournemouth and Christchurch Today.